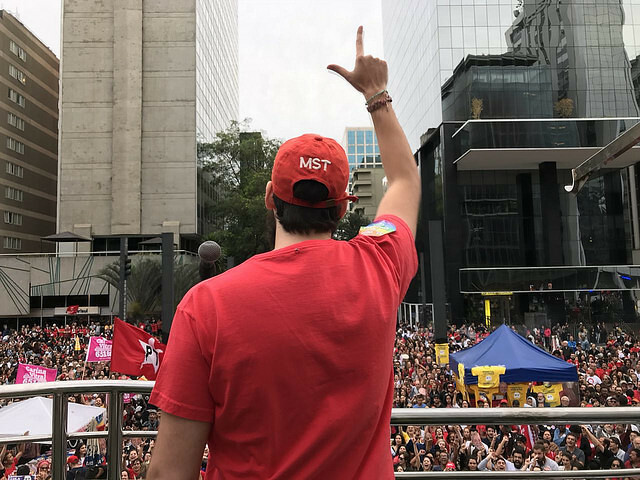 Thousands of people gathered out on one of São Paulo’s most famous streets, Paulista Avenue, to attend the Free Lula Festival on a sunny Sunday, to watch concerts of celebrated Brazilian artists and support Brazil’s former president Luiz Inácio Lula da Silva. The ex-president has been imprisoned since Apr. 7 and was barred from running for office in the country’s upcoming elections, in October. Lula wrote to the audience and the artists who performed at the Free Lula Festival yesterday. His grandson Thiago Trindade read the letter and called the crowd to stay hopeful and optimistic. “They hate our passion for loving and singing, even during times of hatred and forced silence. I've once said you would be my voice, my legs, and my arms. Today, sing for me and dance for me. The day will come when this country will be happy again,” the letter reads. Spectators who attended the Free Lula Festival told Brasil de Fato they feel that Brazil’s democracy is at risk, especially due to the impacts of the 2016 coup. They also feel outraged at the political persecution and imprisonment of ex-president Lula. “Lula is innocent. They have no evidence against him, but they are keeping him in prison since April 7 anyway,” technical assistant Lara Souza, 26, said. An instructor and visual artist, João Belmonte, 35, believes the imprisonment of the ex-president – who had high approval ratings, implemented remarkable social programs to fight poverty, and was in the lead of voter support polls – is an indication that democracy is not being respected in the country. “We can’t say we are living in a democracy. Democracy, which would be people’s will, was interrupted after Lula’s prison and the persecution against left-wing people’s movements. But people have realized it and this is why the festival is important,” he said. Renowned Brazilian artists performed at the festival and expressed their support to the former president, including singers Odair José, Chico César, and Otto, poet Sérgio Vaz, rapper Preta Rara, and others. What is Brazil’s election landscape now that Haddad will replace Lula in the race?